Just as you don't like it when your co-workers don't pull their weight, you don't need work boots to give out on you when you're in the middle of a big project. For durable men's footwear, these Dr. Martens Men's R16942001 Black Steel Toe Rivet Chelsea EH Boots are ... (see full details) (see specifications) #DRMR16942001. Just as you don't like it when your co-workers don't pull their weight, you don't need work boots to give out on you when you're in the middle of a big project. For durable men's footwear, these Dr. Martens Men's R16942001 Black Steel Toe Rivet Chelsea EH Boots are your go-to choice. They're full-grain leather boots with hard-wearing air-cushioned PVC outsoles and contoured, cushioned insoles. You'll have all-around support and comfort with these exceptional boots.Your toes can get crushed at any given second on your job site, that is why this black footwear is equipped with sturdy safety toes. They meet the ASTM F2413-11 MI/75 C/75 EH standard for safety toe protection that'll guard your toes against impacts and compression that can occur from rolling and falling objects. The EH in that ASTM standard indicates you'll also have electrical hazard protection when you're wearing these steel toe boots - even better! You can thank the air-cushioned PVC outsoles for this electrical hazard coverage, as they're made out of a material that absorbs some electrical shocks so your body doesn't have to. The rugged outsoles are also slip-resistant and shock-absorbing. The safety toe boots even have an ASTM F1677-1996 (Mark II Machine) slip rating to make sure you stay on your feet all day. Industrial, tumbled, full-grain leather uppers fend off abrasions for you. You put yourself through rigorous environments, so this footwear will work hard to keep you safe. On the interiors of the men's boots, there's a breathable, mesh foam-backed lining to give you that much-needed comfort. Contoured, cushioned EVA comfort insoles add more cushioning, and these are removable in case you need to clean them, air them out, or replace them eventually. A cement construction brings it all together, providing you with reliable workwear you can count on every day. It's nice to be able to put your trust in something, and these Dr. Martens Men's R19642001 Black Steel Toe EH Slip-Resistant Chelsea Rivet Boots are here to help you do your best. Let them support you by ordering a pair today from Working Person's Store! Same great Dr. Marten quality, without the laces. I was looking for a lazy man's shoe this time. I get up for work around 1 or 2 in the morning, and these were the answer. Look great, fit great, and are comfortable for all of my fourteen hour shift. Not a huge fan of the slip on design because over time the leather does stretch and they feel loose and sloppy on your feet. The sole is top quality and the sticking is great but the design and concept needs to be tweaked a bit. I do wish that they came in half sizes that might be more helpful with the loose design. 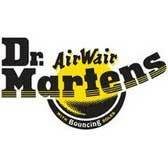 Dr. Martens Boots: Men's R16942001 Black Steel Toe EH Slip-Resistant Boots is being added to your cart.